Families participate in a basic intake, and referrals are provided based on family's needs, goals and community resources. Please bring Social Security Cards for everyone in the household and Driver's License or State ID for those 18 or older in the household. Other services may require additional documentation (such as proof of income). K.C. is a cost reduction program that rewards families for regularly paying their Ameren bill on time. This program is recommended for families with a steady source of income. Assesses homes for health and safety issues. Emergency needs and home repairs are addressed on a case by case basis. Items include but are not limited to smoke detectors, carbon monoxide detectors, water heaters repair/replacement, window unit air conditioners, and furnace testing/cleaning. Other services may include but are not limited to roof & floor repairs, door & window replacement, furnace/air conditioner repair/replacement, electrical & plumbing repairs, and pest control. Educational opportunities are provided for participants on a basic home maintenance/energy conservation, and health hazards in their homes. Follow-up contact may be provided to offer support and training for basic home maintenance & air quality control. Assist with water/sewer bills for Missouri American Water customers in threat of disconnection. An interactive immersion experience that sensitizes community participants to the realities of poverty. An interactive experience designed to challenge youth to think critically about how the choices and decisions made in adolescence may impact their adulthood. REALL is recommended for 7th through 12th grade students. Tax credit for elderly/disabled families with fixed incomes that offsets the cost related to property taxes. Offers assistance with job training, continuing education, and obtaining/maintaining employment by addressing barriers such as transportation, childcare, health, etc. Assist families experiencing a crisis such as a house fire or natural disaster with temporary shelter or relocation services. Provides one-on-one coaching to educate parents/caregivers and children how to manage asthma conditions through inhaler usage training, medication monitoring, and home improvement/maintenance strategies. Supports adults seeking to become active in their community through volunteerism or board membership. Topics include understanding different personality types, goal setting, building teamwork, cultural diversity, conflict mediation, parliamentary procedures, board of directors rights and responsibilities, becoming a 501(c)3, public speaking, and grant writing. Topics include how to: budget; setup a checking/savings account; establish/improve credit; rent and apartment; set up utilities; buy/license/maintain transportation; etc. Provides participants with information to help improve their financial well being. Provides the community with a guided process to engage its residents, businesses, and resources in identifying key issues, developing projects to address identified issues, and identifying/obtaining funding to support their endeavor(s). 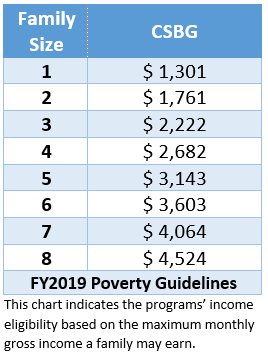 Funded in whole/or part with federal funds received from the U.S. Department of Health & Human Services (HHS), Community Services Block Grant, as provided by Missouri Department of Social Services, Family Support Division. The funds received from the Family Support Division are all federally funded.